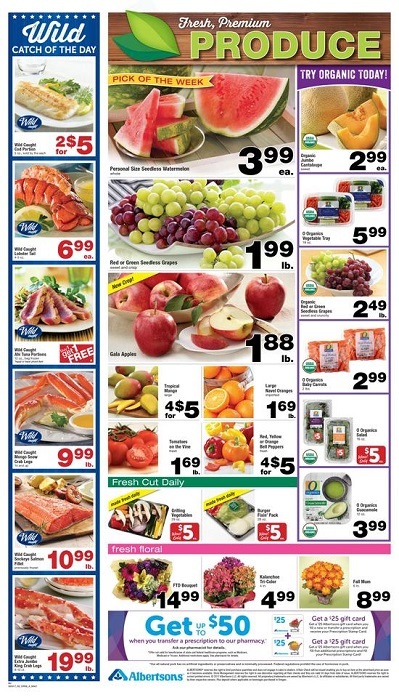 Albertsons weekly ad circular offers Strawberries 2 lbs. Blueberries 59 oz. Rashpberries or blackberries 12 oz. sweet corn, Lucerne butter 16 oz. Simple orange juice or drink 59 oz. Chobani greek yogurt 5.3 oz. Made dresh daily watermelon, cantaloupe, pineapple or grape bowl 20-24 oz. Get Frozen foods & fresh dairy including signature kitchens or O organics frozen fruit 12-48 oz. Darigold flavored milk 16 oz. Florida's natural orange juice 59 oz. Yoplait greek or whips yogurt 4-5.3 oz. Darigold butter 16 oz. Cool whip aerosol whipped topping 7 oz. Eggland's best large AA eggs 18 ct.
Every day is baby day! Get Clearly crafted baby food 4 oz. select varieties, Babyganics 7-9 oz. select varieties, PediaSure or pure bliss 6 pk./8 oz. or 31.8 oz. select varieties, BeechNut Baby Food 4 oz., select varieties. Pampers super diapers 50-100 ct. select varieties, Pamper easy Ups jumbo diapers 18-37 oz. select varieties, Pampers wipes 3x 168-192 ct. select varieties, Luvs jumbo diapers 21-34 ct. select varieties. See General grocery for more saving this week! Green mountaun or Donut shop K-Cup coffee 36 ct.
Dannon oikos or light & fit yogurt 5.3 oz. O Organics squeze mayonnaise 11-25 oz. Red lobster cheddar bay biscuits 11-30 oz. O organic olive oil 16.9 oz. Also see household essentials including Tide laundry detergent liquid 92-100 oz. select varieties. Charmin ultra double roll bath tissue 16 rolls select varieties, Bounty giant roll paper towels 6 rolls. Cascade action pack 16-32 ct. Dawn dish soap 18-21.6 oz. Crest 3D toothpaste 4.6 oz. GAlways pads 24-46 ct select varieties, Tampax tampons 32-36 ct. This Ad may contain time-sensitive information and offers. 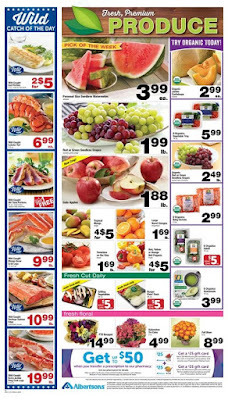 Always check this page for more the latest Albertsons Weekly Ad this week.